Fun car accessories are great gifts! If you need a present for the automobile enthusiast in your life, one of these 6 great car gifts may be ideal. Whether you're looking for a special birthday surprise, an anniversary or graduation gift, or something nice to put under the Christmas tree, there's a perfect present out there. You may even find something to put on your own wish list! It can be hard to shop for auto enthusiasts. After all, most people simply can't afford to run out and buy a new sports car to surprised their loved ones. However, great auto-related gifts don't have to cost thousands of dollars. No matter what your budget, there's a car-related gift out there for you. While you might not be able to afford a new car, you can make an old car feel new again when you get it detailed. Detailing is the process of deep-cleaning a vehicle. Professional auto detailers go over every inch of a car, removing upholstery stains, paint scratches, and even unpleasant odors. Auto detailing prices vary depending on where you live and which provider you choose, but you can expect to spend between $100 and $250. A gift certificate is the best way to give the gift of a detailed car. That way, the recipient can schedule the detailing for a time that's convenient. To make your gift certificate extra special, consider presenting it in a nice greeting card. For the feminine auto enthusiast, look for girly car accessories like pink fuzzy dice or leopard-print floor mats. For new parents, consider a family car sticker that shows off the whole brood. You can even find stickers that include pets. Help a busy mom keep kids from ruining her car by getting her a backseat organizer or cargo net. If your auto enthusiast loves a sports team or college or university, consider purchasing stickers and accessories with the appropriate logo. If you live in a cold climate, you know how unpleasant it can be to get into an icy vehicle first thing in the morning. That's where a remote car starter comes in. These devices, which typically cost between $50 and $200 plus installation, allow a driver to use a key fob to start his or her car from up to 1000 feet away. This gives the car a chance to warm up.To give a remote car starter as a gift, you'll most likely need to know the make and model of the recipient's car. You can buy the starter online and have it installed locally, or you can find a local shop that sells the units. Read remote car starter reviews to find a model that is reliable and has lots of helpful features. 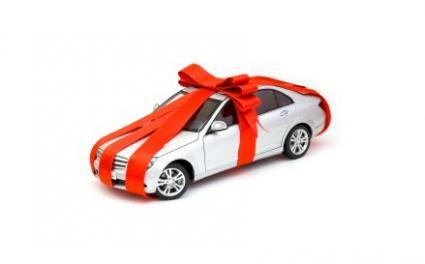 You may not be able to afford a vehicle with a price tag of several thousand dollars, but that doesn't mean you can't afford to give a car as a gift. If you're looking for basic transportation for a new driver or a college student, you can actually find cheap cars for sale on the Internet.As they age, cars depreciate in value. This means that if you're willing to buy an older car, you may be able to find something for under $500 or $1000. An old car can be a great choice for someone with auto repair skills, since they will be able to keep an older car running smoothly. Many new cars come with built-in global positioning systems (GPS), but if you're shopping for someone with an older vehicle, a separate GPS unit might make a great gift. These handheld or dashboard-mounted units typically range in price from under $100 to over $400, depending on the features and capabilities of the model.Before you decide on a GPS unit for a gift, read up on the options. Finding the best GPS for auto navigation is largely about picking a unit that has the features the recipient will need. If you find that you aren't sure which features someone might use, consider giving a gift certificate for a GPS unit. A car's tires can have a dramatic effect on its performance and safety. If the auto enthusiast in your life is driving on a set of worn tires, a new set might be a great gift. Typically, a new set of tires ranges in price from $200 to over $600. You might consider giving tires as a group or family gift, since they are so expensive.In addition to improving a car's handling in wet or snowy weather, new tires may also help improve a car's performance. Read reviews of the various types of tires on the market before you choose a set as a gift. No matter what your budget, there's sure to be a present that will please. One of these 6 great car gifts will be perfect for the auto enthusiast on your list.